Nothing says comfort food like pot roast on a chilly day. It's easy to make in a Dutch oven and even simpler in a crockpot. This recipe, which cooks the roast in beef broth and Italian salad dressing mix, makes a well-seasoned pot roast that is a nice change from the more classic taste. It's an excellent pot roast to shred for sandwiches. Searing the roast not only enhances the flavor -- it will improve the texture and color of the meat. If you're short on time, go ahead and skip the browning step. What cuts of meat are best for pot roast? 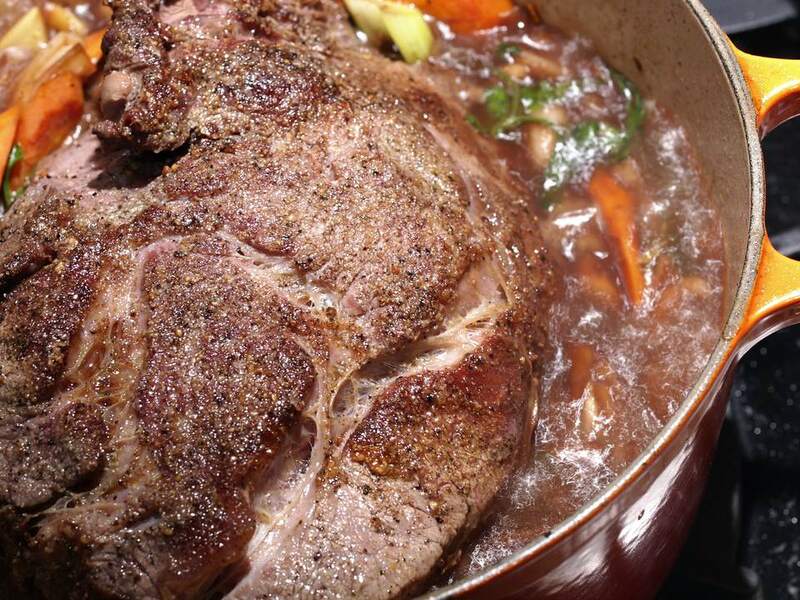 Pot roast is by definition cooked for a long time at a low heat, whichever method you use. And that means tougher cuts that you couldn't possibly eat if you cooked them for a short period of time. These cuts turn out succulent and flavorful after hours of slow cooking. They're very inexpensive and usually cover more than one meal, so they are great for families. The cuts to look for are chuck roast, boneless chuck roast, chuck arm roast, chuck shoulder roast, chuck seven-bone roast, brisket or round roast. Season the beef on both sides with the salt and pepper. Add olive or vegetable oil to a heavy skillet and brown the roast well on both sides. Place the pot roast in a slow cooker. Combine the au jus mix, the Italian salad dressing mix, the beef broth and the water and pour over the roast. Cover and cook on low for 8 to 10 hours, or until the beef is very tender. Serve the pot roast with vegetables or shred it and serve it on split, toasted sandwich buns. Add whole onions, potatoes, carrots, and celery to the pot toward the end of cooking, and you have the traditional presentation and a full meal. For this Italian-flavored pot roast, omit the vegetables and instead go full-on Italy and serve spaghetti tossed in olive oil and garlic as a side, along with a Caesar salad or Italian salad with greens, artichokes and vinaigrette dressing. Or bake Idaho or Yukon gold potatoes and serve with butter, sour cream and cheddar cheese, a tasty accompaniment to a beef roast. Other possible sides are seasoned wild rice; rice pilaf; or a blend of wild, red, brown and white rice; or bulgur pilaf. Serve steamed and seasoned green beans, broccoli, lima beans or asparagus with the rice or baked potato sides. Add French or sourdough bread for a hearty dinner. Dry red wine makes a classic pairing with a beef roast. Try a big red like malbec, zinfandel, cabernet sauvignon or a blend that features one of these varieties.